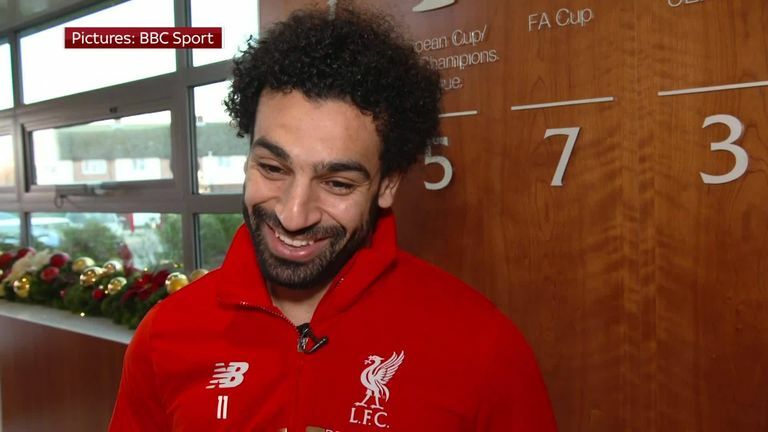 Mohamed Salah says he's delighted to win the African Footballer of the Year for a second year running, but his main goal is to win a trophy with Liverpool. Liverpool forward Mohamed Salah has been named BBC African Footballer of the Year 2018 for the second year in a row. The Egyptian fended off competition from both Liverpool team-mate Sadio Mane and Napoli centre-back Kalidou Koulibaly to claim the prize. Juventus defender Mehdi Benatia and Atletico Madrid midfielder Thomas Partey were also in the running for the award. "It's a great feeling to win again. I'm happy and I would like to win it also next year," Salah told the BBC. "There have been many good moments in 2018. The game against Roma at Anfield (Champions League semi-final, first leg) was unbelievable. "I'm scoring goals and helping the team to get the points to be top of the league. That's always a great feeling." Salah finished his first season at Anfield as top scorer in the Premier League after finding the net on 32 occasions. In total, Salah scored 44 times in all competitions last season and he has continued that form this campaign, where he currently leads the scoring charts alongside Arsenal's Pierre-Emerick Aubameyang with 10 goals to his name. A record number of votes were cast for the 2018 award, with the BBC receiving over 650,000 in total. Salah becomes the first player since Nigeria's Jay-Jay Okocha to win the award in consecutive years.